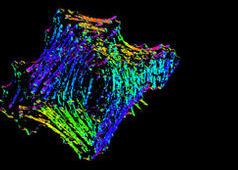 What is the steady state phase of actin polymerization? In the steady state phase, the filament dynamics enter a state of equilibrium where monomer disassembly from the (-) end and polymerization at the (+) end is balanced and maintained by a critical concentration of monomers in the cytosol. This steady state assembly and disassembly is known as ‘treadmilling’. 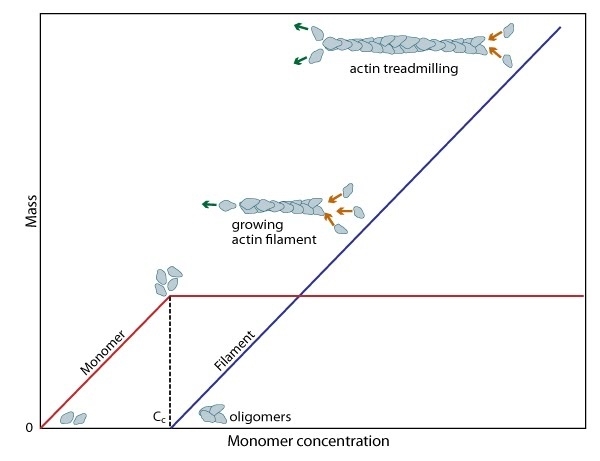 A steady pool of actin monomers must be maintained to enable a polymerization to continue beyond the rapid elongation phase. 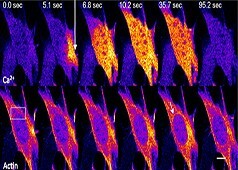 This is, in part, aided by the actin binding protein profilin, which promotes ADP to ATP nucleotide exchange on G-actin. However, the rate of monomer dissociation from the (-) end of the filament is also important. 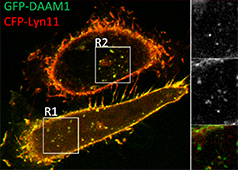 Dissociation of the subunits ultimately results from ATP hydrolysis, which induces a conformational change in the actin subunit that weakens its association with neighboring subunits (as reviewed in ). The concentration of actin monomers in the cytosol will either favor disassembly, or assembly of the actin filament, and these values are known as the critical concentration (Cc). When the concentration of free subunits exceeds the Cc, filament elongation occurs spontaneously . Importantly, the Cc usually varies between the filament (+) end and the (-) end. At the steady state, which is achieved when the rate of filament polymerization is equally balanced by filament disassembly, the free subunit concentration is higher than the Cc at the (+) end and lower than the Cc at the (-) end. This results in subunits being added to the (+) end and dissociating from the (-). 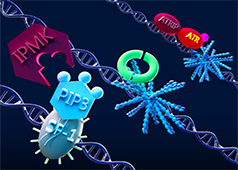 When the association rate of free ATP-G-actin is greater than the rate of subunit loss, the filament appears to grow, creating a ‘cap’ rich in ATP-subunits . 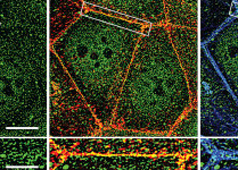 Conversely, when the association rate of free ATP-actin is lower than the rate of subunit loss, the filament is seen to shrink. 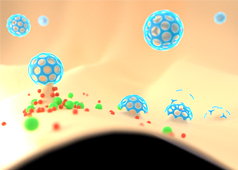 When the association rate of free ATP-actin is equal to the rate of dissociation at the (-) end, no net growth occurs and this is known as ‘treadmilling’.